BROOKFIELD — School officials are having engineers take a look to see what can be done to repair structural problems with school buildings constructed in 2011 as part of a new school complex. Brookfield Local Schools Superintendent Velina Jo Taylor said problems include the rock shifting below the middle school — causing cracked floors and walls and a sinking floor — as well as roof shingles needing replaced because of poor ventilation, roofs leaking and the metal frames of cafeteria windows falling apart. Taylor said in late December, attorneys with a background in engineering did a structural investigation and walk through of the school complex, inspecting the inside and outside of the buildings. “They looked at various areas of the buildings and saw our concerns with some construction issues. We want them to see what can be done to address some of the issues,” she said. 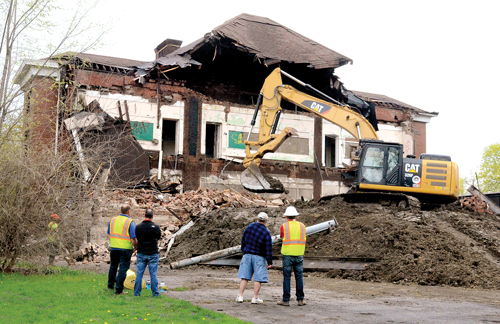 Treasurer Craig Yaniglos said the school wants to contact the Ohio Facilities Construction Commission, the successor of the Ohio School Facilities Commission, which was the district’s partner in building the new school complex in 2011. He said the district would like to see if money is available to correct the building problems. Taylor said the district should have estimated costs in about a month. The board has placed a 1.9-mill permanent improvement levy on the May primary ballot, but those funds would be used for purchasing school buses, textbooks and other items, and not put toward major building projects. School officials said they would work with OFCC to see who is at fault for some of the building problems and how they can be rectified. Taylor said the floor shifting and the roof leaking could be caused by problems that are not the district’s fault. “We need to pinpoint why this is happening and get to the root of the problem. When we were walking around looking at the buildings, they gave us an interesting perspective of what may be the cause,” she said. For example, the shifting floor and cracking walls at the middle school may be because of the shale foundation shifting. Taylor said the attorneys are reviewing the matter to see if the buildings were constructed correctly. Yaniglos said the OFCC may want to bring back some of the contractors hired for the original project, but Taylor said the attorneys may want to bring in experts unrelated to the project to look over the work. The district had hired CTL Engineering of Akron to monitor the movement of the shale and look over a failed 2013 repair attempt.